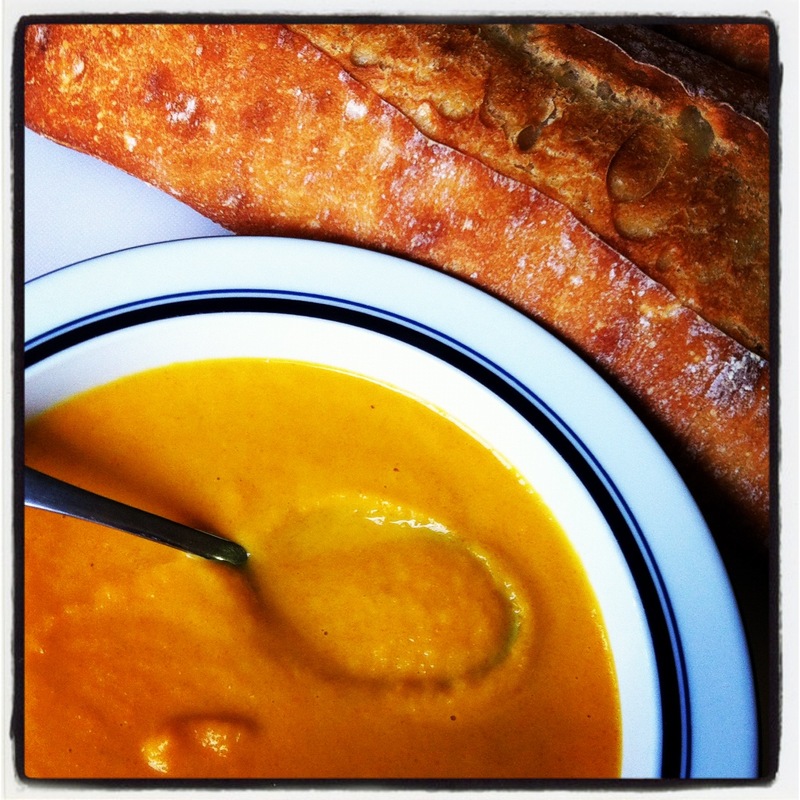 Tonight we had Carrot-Ginger Soup for dinner. It’s really a very easy recipe, except for all the chopping. You have to cut up two onions and two pounds of carrots. For Mother’s Day one year my husband signed me up for a knife skills class because my chopping made him nervous. I was scared of using his big sharp knives so I would try to chop everything with a steak knife, it took forever and all the vegetables would roll away. The knife skills class really made me much more confident with a real knife. During the class we were seated in groups of 4. The woman that sat across from me was a single accountant that liked to talk about her very busy schedule. She was nice enough, but at one point she looked across at me and said “You’re a stay at home mom so you probably have lots of time to sit around and practice chopping vegetables.” On to the soup! I got the recipe here from Food Network. There are hundreds of carrot ginger soup recipes online, but the one seemed to have a minimal amount of fuss. It’s also well suited to hanging out in a crock pot, the past two pumpkin carving parties we had the soup in a crock pot and hot bread coming out of the oven all evening to accompany it. It always is a hit and is probably one of the cheapest ways to feed a large group of people. In a large pot saute the chopped onions and butter until the onions are limp. Add broth, carrots, and ginger, cover and bring to a boil. Reduce heat and simmer until carrots are tender, or do what I do and start some laundry, check the email and at some point say “Shoot, I have soup cooking!” and run to the stove. It really is a very forgiving recipe. The original recipe says to use a blender in batches, but I have my trusty immersion blender that I love. It is the best tool for jams and soups, my husband has made whipped cream with the whisk attachment. However you do it, go until it’s smooth. 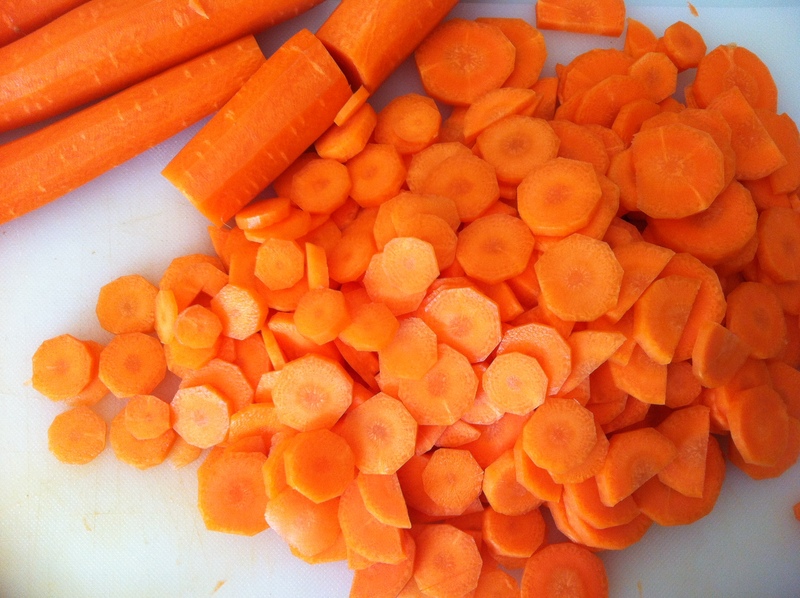 I miss a carrot slice or two every time, my husband says it makes the soup more textural and interesting. Add the cream and bring to a boil and add your salt and pepper to taste. Serve with a dollop of sour cream if you would like, I serve a nice crusty bread on the side. HEB makes a nice line of frozen artisan breads and I just use those, tonight was a couple of loaves of ciabatta. This entry was posted in Cooking, Instagram, Project 366, recipes and tagged carrot ginger soup, carrots, chopping, dinner, Instagram, knife skills, recipe, soup, vegetarian. Bookmark the permalink.